SI-Cards10/11 and SIAC complete the punching cycle in about 60ms. This is nearly twice as fast as SI-Card8/9, the most advanced SI-Cards so far. SI-Card11 features an integrated electronic module. There is an optical feedback signal (flashing LED) indicating the finished punching process. In general SI-Card11 offers a smarter experience. There is exactly one feedback signal cycle from the SI-station. The next feedback signal is flashing by the SI-Card. The flashing signal stays active also after having left the control point. SI-Card11 feedback signals are powered by battery. Power consumption is very low. Based on calculations there is enough power to activate up to 30,000 flashing cycles. The SI-Card11 features a fallback option. If the battery is faulty the device works like the passive SI-Card10. So any risk is eliminated. 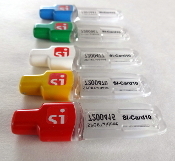 SI-Card11 comes with a chrome tip and transparent body. The flashing LED illuminates the SI logo at the tip and broadcasts into the transparent body.